A sad loss for the modern literary community. 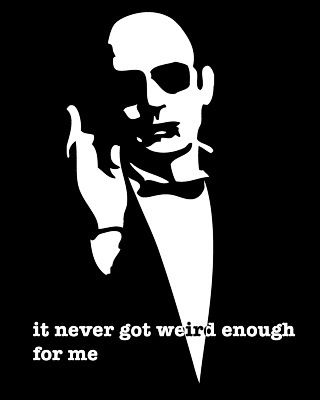 Hunter S. Thompson, a.k.a. 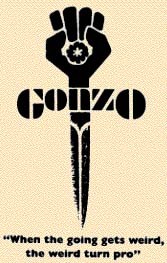 Dr. Gonzo, a.k.a. Raoul Duke, is one of my favorite writers. If you're cynical about politics and pop culture during the 60s, 70s, 80s, or even the 90s, read his books. Along with Tom Wolfe, Thompson established what has become known as The New Journalism, or "Gonzo" Journalism. The journalist takes objectivity and throws it out the window; the result is a mixture of fact and opinion, with no clear division between the two. 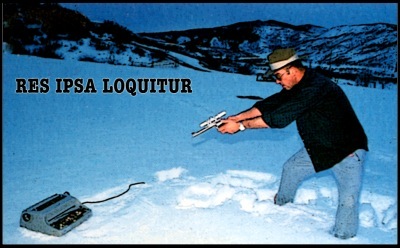 Hunter S. Thompson ran a nearly-succesful campaign for the sheriff of Aspen, Colorado in 1970 on the "freak ticket." His platform was pretty direct: an end to the selling-off of Aspen. What follows is an excerpt from an advertisement Thompson took out in the Aspen Times: "And now we are reaping the whirlwind-big-city problems too malignant for small-town solutions, Chicago-style traffic in a town without stoplights, Oakland-style drug busts continually bungled by simple cowboy cops who see nothing wrong with kicking handcuffed prisoners in the ribs while the sheriff stands by watching, seeing nothing wrong with it either." The Party posters bore a red fist clutching a peyote button. "We ran straight at the bastards with an out-front mescaline platform ... marijuana got lost in the scramble." Thompson relented a bit before the election, saying he would refrain from taking mescaline while on duty. In the end Thompson lost the race 1500 to 1065. He did delight in the fact that he won the city vote, where the Freaks made up 30% of the electorate. But he was trounced in the county vote -- even losing 300 to 90 in his own precinct of Woody Creek. Perhaps the most clear description of Freak Power came from one of the many campaign posters written by Thompson: "This is the real point: that we are not really freaks at all -- not in the literal sense -- but the twisted realities of the world we are trying to live in have somehow combined to make us feel like freaks. We argue, we protest, we petition -- but nothing changes." Lots more about Thompson's life and work can be found here.